A simple elegant hand cut design reminiscent of the style and lifestyle of the Art Deco Era. 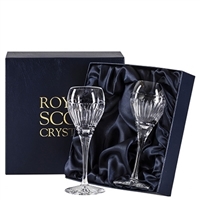 Set of 2 24% hand cut lead crystal port, sherry, liqueur or dessert wine glasses by Royal Scot Crystal Art Deco Design. Set of 2 24% hand cut lead crystal large wine or red wine glasses by Royal Scot Crystal Art Deco Design. 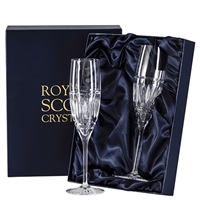 Set of 2 24% hand cut lead crystal Champagne flute glasses by Royal Scot Crystal Art Deco Design. Presentation boxed. 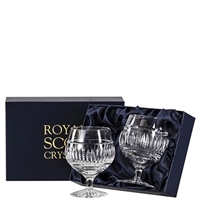 Set of 2 24% hand cut lead crystal brandy balloon glasses by Royal Scot Crystal Art Deco Design. Presentation boxed. 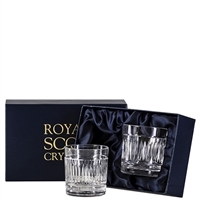 Set of 2 24% hand cut lead crystal whisky tumbler glasses by Royal Scot Crystal Art Deco Design. Presentation boxed. Set of 2 24% hand cut lead crystal large whisky tumbler glasses by Royal Scot Crystal Art Deco Design. Presentation boxed. Set of 2 24% hand cut lead crystal tall high ball tumbler glasses by Royal Scot Crystal Art Deco Design. Presentation boxed. 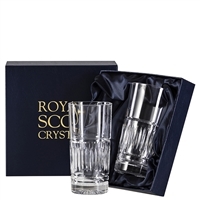 Set of 2 24% hand cut lead crystal barrel G & T or whisky tumbler glasses by Royal Scot Crystal Art Deco Design. Presentation boxed. 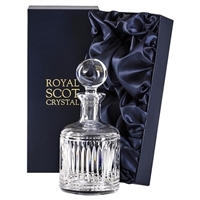 24% British Cut Lead Crystal Round Spirit or Whisky Decanter by Royal Scot Crystal. Presentation Boxed. 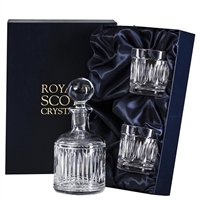 24% British Cut Lead Crystal Square Spirit or Whisky Decanter by Royal Scot Crystal. Presentation Boxed. 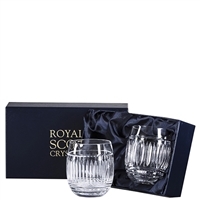 24% British Cut Lead Crystal Round Spirit or Whisky Decanter with Two tumblers Set by Royal Scot Crystal. Presentation Boxed. 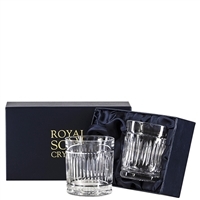 24% British Cut Lead Crystal Traditional Square Whisky Decanter with Two tumblers Set by Royal Scot Crystal. Presentation Boxed. 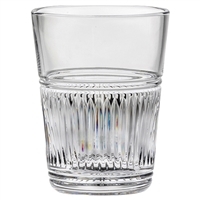 24% British Cut Lead Crystal Water for Whisky Jug by Royal Scot Crystal. Gift Boxed. 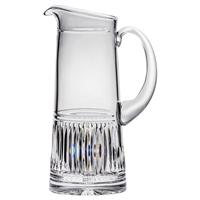 24% British Cut Lead Crystal Cocktail, water or juice pitcher jug by Royal Scot Crystal. Gift Boxed. 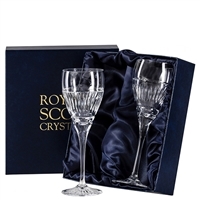 24% British Cut Lead Crystal Ice Bucket by Royal Scot Crystal. Gift Boxed.